Maria Genné Featured on the Cover of Minnesota Good Age! - Kairos Alive! Maria Genné Featured on the Cover of Minnesota Good Age! Meet Maria Genné, the charismatic center of the Twin Cities-based dance group Kairos Alive! As a child, Maria Genné was always dancing. And so Genné didn’t stop moving, she kept on dancing and even made dancing her profession. In 1999, she founded her own one-of-a-kind dance company, Kairos Alive! Her 19 company dancers, ages 8 to 91, don’t usually perform on a stage, however. No, they — with Genné’s incredibly contagious energy and dancer’s grace at the helm — make their dance magic in Twin Cities schools, nursing homes and community centers. Maria Genné has mastered the art of dancing with people who are seated. Photo courtesy of Kairos Alive! Kairos Alive! performances, you see, aren’t meant for watching, but for joining, including those who can’t even stand. “I tell elders, ‘It’s when you’re having such a good time that you forget what time it is.’ A good thing for an intergenerational group,” Genné said. Although Genné studied back in the day with famous choreographers such as Merce Cunningham — who was at the forefront of the American modern dance movement for more than 50 years — she realized she didn’t want to be in someone else’s dance company. From a very young age, I thought that if you were just on stage, you weren’t connecting. I always wanted to figure out how you could do both,” she said. During her career, Genné found herself working with young children, seniors and people with developmental disabilities, too. She wondered: “How do I keep that creative connection going across generations? If I want people of all different ages to really come together, I have to show what that looks like. So that’s the reason for starting Kairos,” she said. The Kairos Alive! mission is to transform lives through dance and story with intergenerational, intercultural participatory arts programs for all ages and abilities, designed to nurture, heal and create community. And for the past 10 years, Genné has been succeeding in that mission at a time when it’s perhaps needed most — as baby boomers begin to age in large numbers — by working alongside professionals in the arts, health care and social services with a special emphasis on older adults. Maria Genné, known for her unique ability to engage older adults, was featured in the PBS documentary, Arts & The Mind, in 2012. Photo courtesy of Kairos Alive! Brain research supports the importance of being creatively engaged as we age. In 2001, The Creativity & Aging Study — directed by the late Dr. Gene Cohen, then director of the Center for Aging, Health and Humanities at George Washington University — documented the positive impact of elders’ participation in creative programming, including improvements in physical, social and emotional well-being. In The Mature Mind: The Positive Power of the Aging Brain, Cohen (a friend and mentor to Genné) concluded that both hemispheres of the brain are used more efficiently and become more creative, not less, as we grow older. Contrary to the old belief that brain cells stop forming, Cohen asserted that humans continue to grow new brain cells throughout life. Regular dancing may also be beneficial for the aging human brain. Scientists believe the social and creative aspects of dancing make it a particularly powerful activity for older adults. 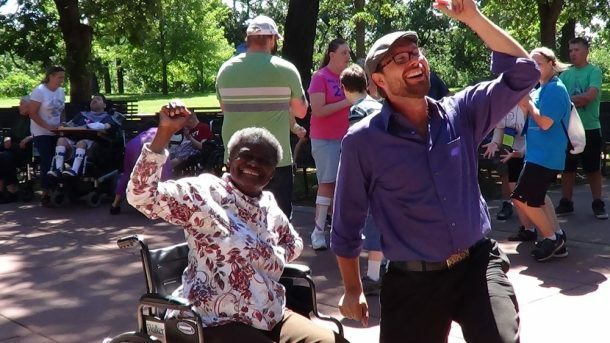 Social dancing is even being used to teach people with Parkinson’s. “It’s one of the best things we can do for health and well-being — no matter what your age or cultural background is,” Genné said. Kairos Alive! offers a variety of Choreography of Care programs designed to promote personal and community wellbeing, including Intergenerational Dance Hall programs for the public as well as Dancing Heart weekly programming in long-term care centers and assisted-living facilities. Even people who are physically frail or who face Parkinson’s or Alzheimer’s can participate in weekly arts activities. Genné developed her award-winning Dancing Heart program in 2001. “I just saw frail elders who did a lot of sitting around,” she said. The Dancing Heart program taps into the creativity of older adults and invites them to be collaborators in the artistic process of dance, music and storytelling. Genné and her company of dancers engage older adults of all abilities in the weekly 90-minute programs, incorporating elders’ personal stories of joy and grief into the choreography of the dance, helping them become creatively engaged not just physically, Genné said. As a seasoned choreographer, Genné has been able to create many different ways to do what she refers to as a chair dance. Charismatic, fit and muscular, she dances with — and around — folks in wheelchairs, throwing in sidekicks, hip sways and delicate toe tapping, too. Her seated partners can’t seem to resist her beaming smile, her graceful outstretched, swaying arms. Genné encourages sitting participants to use their upper bodies by stretching their arms up and out, by leaning side to side, even incorporating their legs and hips, all while sitting. They begin to move their arms on their own — with vigor. Their toes start tapping right along with hers in smaller, yet similar, steps of their own. In Maria & Ida, a 2014 YouTube video, Genné does all the above and more in a beautiful simple dance with an elder. In yet another video, she does the bunny hop with a room full of older adults sitting in wheelchairs. They’re reluctant at first, but by the end it’s clear they’ve converted their inhibitions into joy. To really appreciate Genné’s work is to attend one of her Kairos Alive! dance halls (or view one on YouTube). All ages, backgrounds and abilities are invited to dance to live music by professional musicians with a goal of promoting arts participation, health education and community well-being. Oftedahl, who’s worked in the health-care industry for more than 40 years, said Genné’s work has opened his eyes. He said Genné’s work transcends ethnicity, mental status and location. “Her work engages people — and brings great joy and happiness to what is often a lonely, isolated, dispirited population,” he said. Last year, Kairos Alive! facilitated 50 dance halls at 17 different locations. Kairos Alive! also offers Moving Well training and education series to people involved with intergenerational or older adult programs; Community Arts and Wellbeing residencies; and, about a dozen times a year, Kairos Alive! Performance Troupe performances, featuring works from the company’s repertoire, including pieces created in collaboration with partners. Genné grew up in Chicago in the 1960s during the early Civil Rights movement. She lived in Hyde Park near the University of Chicago, a richly integrated multicultural neighborhood where she witnessed social change, including a Martin Luther King Jr. rally. Her mother paid for some of her first dance lessons with a Social Security check that came after Genné’s father passed away. Genné’s work in the field of arts and aging hasn’t gone unnoticed. In 2012, Kairos Alive! was featured in the PBS documentary, Arts & The Mind. Her intergenerational programs have received numerous awards and she’s invited to speak at aging conferences around the country. When Genné sees dance participants enjoying what she calls “Kairos moments” — when art and community come together in the moment — she feels empowered. When she’s not dancing, Genné is busy writing grants and making new connections to keep her vision alive, including the key elements of accessibility and creativity. She’s experimenting with technology to reach more people, including Zoom. Using the web-conferencing software, Genné is producing what she refers to as “webasodes,” live productions that would allow people to watch and participate at the same time — ideally with someone else in the room, dancing with them, of course. Her goal is to eventually host a weekly program. Genné and her husband, Cris Anderson, a filmmaker, writer and creative consultant, have called Minneapolis home for 38 years and have raised two daughters, Elinor and Parker, during that time. Genné’s daughter, Parker, who works at Kairos, said her mother has helped her see — and celebrate — the gifts in people that usually go unnoticed. Lately, Genné has been thinking about the future of her work, her legacy. Radical Welcome, a book she hopes to be writing soon, will detail her process for working toward community well-being and her methods for sharing the joy of music and story together. Genné knows she, like all of us, is destined for older adulthood. Robin Sauerwein is a local freelance writer who lives in Northeast Minneapolis where she writes about the people and places in her neighborhood. She encourages others to write in her community education classes. Follow her musings at robinldyson.wordpress.com. Read about the other teaching artists and dancers involved with Kairos Alive! at kairosalive.org, where you’ll also find videos of Kairos Alive! in action, volunteer and donation opportunities and information about creative aging.